bl.uk > Online Gallery Home	> Online exhibitions	> Asia, Pacific and Africa Collections	> Tomb in Beejapore. 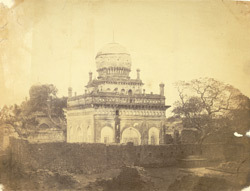 A photograph of a tomb in Bijapur from the 'Vibart Collection of Views in South India' taken by Henry Hinten about 1860. Shah Karim Muhammed Qadri’s tomb (1741) situated near the southeast corner of the Jami Masjid. The ceiling is alleged to be coated with pulverised mother of pearl.